Four Puzzle Benches of Fun Activity! Puzzle benches connect together to form a Circle of Fun. 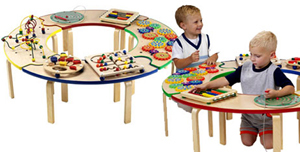 Puzzle benches can also be separated for individual play.